White House Press Secretary Sarah Huckabee Sanders has released a new set of rules that journalists must follow if they want continued access to White House press briefings. In a statement released Monday, Sanders said: “We have created these rules with a degree of regret” before blaming CNN’s Jim Acosta for the decision. White House press briefings are already rare as it is, so it was only a matter of time before the White House found the appropriate pretense to just go ahead and make the (largely pointless) spectacle a little harder for reporters. 1) A journalist called upon a question will ask a single question and then yield the floor to other journalists. 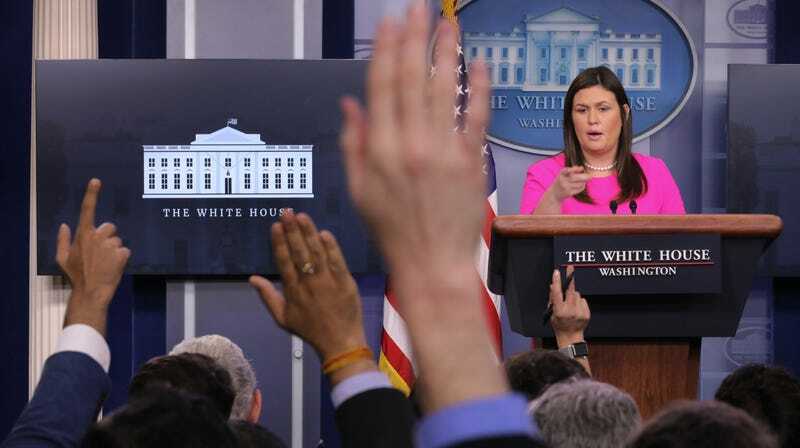 2) At the discretion of the President or other White House official taking questions, a follow-up question or questions may be permitted; and where a follow up has been allowed and asked, the questioner will then yield the floor. 3) “Yielding the floor” includes, when applicable, physically surrendering the microphone to White House staff for use by the next questioner. 4) Failure to abide by any of the rules (1)-(3) may result in suspension or revocation of the journalist’s hard pass. The White House Correspondents Association isn’t pleased, though almost certainly won’t do anything about it! How will the new rules even work? Will the president or White House official first agree to answer a follow up question before the journalist even asks one? Will this make the briefings less pointless? (No.) Should I listen to “New Rules” by Dua Lipa right now? Find out at the next press briefing, whenever that is!